International developments since the mid-1990s have signalled an awareness of the importance and validity of traditional knowledge and cultural property. The adoption of the Convention on Biological Diversity, and the establishment of the WIPO Intergovernmental Committee on Intellectual Property and Genetic Resources, Traditional Knowledge and Folklore demonstrate an emerging trend towards the recognition of the rights of communities and the importance of culture in shaping international law and policy. This book examines how developments to protect collectively held knowledge transpose to circumstances which may not meet the usually understood criteria of what is considered to be an indigenous or traditional group. This includes communally derived cultural products which have emerged out of communities and subsequently formed a part of the national or popular culture. The book considers the steel pan of Trinidad and Tobago, punta rock music from Belize, Brazilian capoeira, and the cajón of Peru as key cases studies of this. 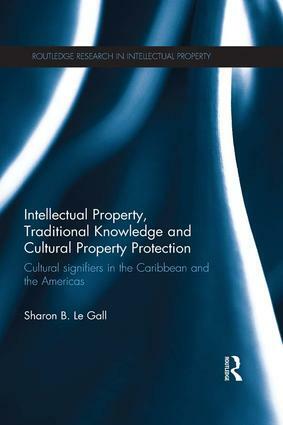 By exploring the impact of past and recent international developments to protect traditional knowledge, Sharon Le Gall highlights a category of cultural signifiers which lies outside the scope of intellectual property protection, as well as the protection proposed for traditional knowledge and advocated for intangible cultural property. The book proposes a reinterpretation of Joseph Raz’s interest theory of group rights in order to accommodate the rights advocated for collectively derived cultural signifiers on the basis of their value as symbols of identity. In doing so, Le Gall offers an original account of how those signifiers, which may not be described as exclusively ‘traditional’ or ‘indigenous’ and held in ways which are not ‘traditional’ or ‘customary’, may be accommodated in emerging traditional knowledge laws. "This very well-written book has a useful bibliography and is comprehensively footnoted. It bears careful reading by those interested in international intellectual property law and cultural policy"
Sharon B. Le Gall is a lecturer at the University of West Indies, Trinidad and Tobago.